Round two: Crossover Projekt 2015 - crossoverprojekts Webseite! Isabel Gotzkowsky and Friends and the Crossover Projekt invited once again! 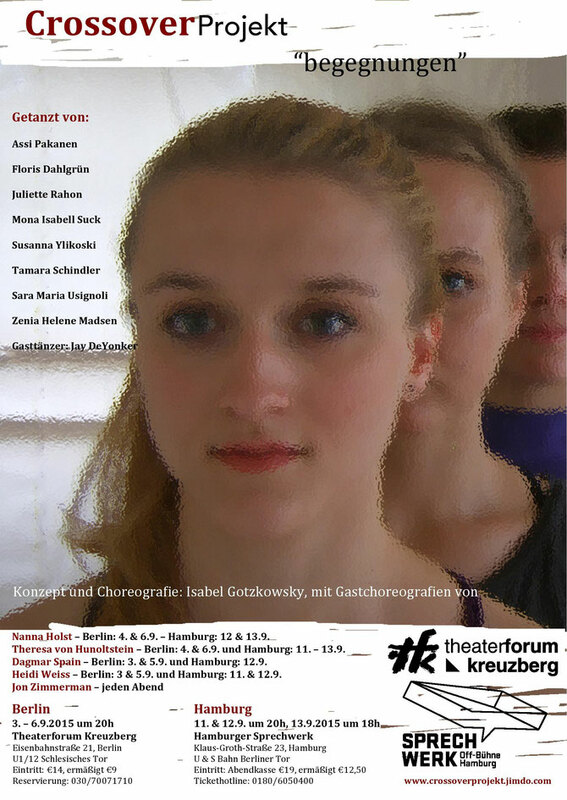 On November 2nd, 2014 we held an audition in Berlin to look for dancers for the next year. We were excited by the wide range of nationalities that applied and are thrilled to announce that we invited 12 dancers from 8 nations! "Life is like being on the Road, as long as you move forward you will always be meeting a new sight, on the road you will always see signs telling you how to behave on the road, telling you what to do, limit 90 km/h, STOP, One Way ... the same in life, you are an individual but still you live in a Society with rules, restrictions and limitations... what is the right way to go, do you go right or left, do you follow the rules or do you break them... how do you handle what comes at you and the obstacles you meet...even if you stand still time will always be passing by. Jack Kerouac, wrote "on the Road" about a road trip in the 1940s, and just like him we will be going for a ride..."
To Be left by a person of a particular situation or circumstance. The reality of the traits of our being that gradually coming afraid when saying goodbye . Past behind and draw through this strength and new courage . Lost Souls waiting for hope. Torrential grief. Choreographed by Teresa of Hunoltstein is about eight people deal with each other , against each other and on their own with the fact of leave-taking . Why is it that everyone else deal with this issue? For some, this comprehensive theme is easy to handle , the other applies Breaking and be used to offset - or not ? What is behind this emptiness one feels when one is left and must find a way for yourself to re-energize for the way forward ? This new work has been developed by choreographer Dagmar Spain and seven dancers. It faces the issue of detachment from others, from the group, the liberation from old structures, and also the importance of support from others to strive forward. What do we need to go on a new, potentially very different path. Can we prepare for it or does the path reveal itself while we are on it? While working with these issues, the dancers are encouraged to contribute their own individual voice to this choreography through structured improvisations The composer Jose Ramon Gonzales will be inspired by the video recordings of the rehearsals and will create a score to support the dynamic flow of this intensive work. Do we sense the vibration? TIME BEING is an investigation into the senses- How do we feel each other? How do we deal with the spirals and waves, the flux of this vibrational field where we exist? Can we stop the noise and tune in?, or are we forever diving in and out of awareness, caught in an endless storm of confusion. The image of a man clothed in a suit can have social and cultural connotations of strength. In Mergers & Acquisitions, this image is layered upon the suggested gentleness and romanticism of red roses and enhanced by soft operatic music. The dynamic tensions inherent in the juxtaposition of strength and subtlety are explored as the male dancers in this duet, clothed in business suits, adorn and feed each other rose petals. With suggestions of dominance and acquiescence, they support and manipulate each other until their struggle is ultimately resolved into mutual balance. A liquid adagio, this piece brings these opposing forces together in a peaceful struggle, performed with professional skill and intensity. This piece received its world premier as part of Dance Theatre Workshop's 'Fresh Tracks' series in November 1999. And a new work created by Isabel Gotzkowsky with the dancers. More information on the new work will be posted soon.